Mr. WATT of North Carolina. Madam Speaker, I yield 4 minutes to the gentleman from Texas (Mr. PAUL). Mr. PAUL. Madam Speaker, I thank the gentleman for yielding me the time. Madam Speaker, I rise in opposition to this amendment. I have myself served 5 years in the military, and I have great respect for the symbol of our freedom. I salute the flag, and I pledge to the flag. But I served my country to protect our freedoms and to protect our Constitution. I believe very sincerely that today we are undermining to some degree that freedom that we have had all these many years. We have not had a law against flag desecration in the 212 years of our constitutional history. So I do not see where it is necessary. We have some misfits on occasion burn the flag, which we all despise. But to now change the ability for some people to express themselves and to challenge the First Amendment, I think we should not do this carelessly. We have written a lot of laws since then. But every time we write a law to enforce a law, we imply that somebody has to arrive with a gun, because if you desecrate the flag, you have to punish that person. So how do you do that? You send an agent of the government to arrest him and it is done with a gun. This is in many ways patriotism with a gun. So if you are not a patriot, you are assumed not to be a patriot and you are doing this, we will send somebody to arrest them. Our Nation was not founded on devotion to symbolic idols, but on principles, beliefs and ideals expressed in the Constitution and its Bill of Rights. American veterans who have protected our banner in battle have not done so to protect a golden calf. Instead, they carried the banner forward with reverence for what it represents, our beliefs and freedom for all. Therein lies the beauty of our flag. A patriot cannot be created by legislation. I think that is what we are trying to do. Out of our frustration and exasperation and our feeling of helplessness when we see this happen, we feel like we must do something. But I think most of the time when we see flag burning on television, it is not by American citizens, it is done too often by foreigners who have strong objection to what we do overseas. That is when I see it on television and that is when I get rather annoyed. I want to emphasize once again that one of the very first laws that Red China passed on Hong Kong was to make flag burning illegal. The very first law by Red China on Hong Kong was to make sure they had a law on the books like this. Since that time they have prosecuted some individuals. Our State Department tallies this, keeps records of this as a human rights violation, that if they burn the flag, they are violating human rights. Our State Department reports it to our Congress as they did in April of this year and those violations are used against Red China in the argument that they should not gain most-favored-nation status. There is just a bit of hypocrisy here, if they think that this law will do so much good and yet we are so critical of it when Red China does it. We must be interested in the spirit of our Constitution. We must be interested in the principles of liberty. We should not be careless in accepting this approach to enforce a sense of patriotism. 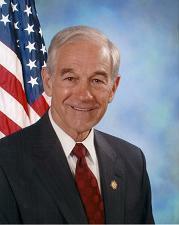 1999 Ron Paul 66:1 Madam Speaker, I thank the gentleman for yielding me the time. Here, Ron Paul thanks The Honorable Melvin L. Watt of North Carolina. 1999 Ron Paul 66:4 the first amendment probably should be capitalized: First Amendment. 1999 Ron Paul 66:6 It is assumed that many in the military who fought, but I think the gentleman from North Carolina pointed out aptly that some who have been great heroes in war can be on either side of this issue. This sentence is defective, since it should say, between fought and but just what is assumed. One possible explanation is that Ron Paul meant, It is assumed that many in the military who fought support this proposed amendment, but I think the gentleman from North Carolina pointed out aptly that some who have been great heroes in war can be on either side of this issue. 1999 Ron Paul 66:9 Our State Department tallies this, keeps records of this as a human rights violation, that if they burn the flag, they are violating human rights. Here, Ron Paul apparently misspeaks. Perhaps he meant, Our State Department tallies this, keeps records of this as a human rights violation, that if they are prosecuted because they burn the flag, they (the Red Chinese government) are violating human rights.